The world's first plastic paint can with a straight sidewall and a patented tamper evidence 'Liftab' are just two examples of Viscount Plastics New Zealand innovations in rigid-walled packaging, the category term describing plastic pails, containers and cylindrical cartridges (used in caulking guns). Developed specifically for a key customer, the EZY Can earned Viscount Plastics a New Zealand Institute of Packaging Award for Innovation and continues to win over retailers and consumers. The can's lid also incorporates the patented 'Liftab' which in this application works as an in-built lever to prise off the lid. 'Liftab' was originally developed by Viscount Plastics for the food processing and ingredients industries as a highly visual tamper evidence device that didn't present the waste disposal issues of a tear-off strip. Moulding and despatch of pails and containers for food items are carried out in certified clean rooms at our state-of-the-art Auckland complex where we also have manufacturing facilities for pails containing dangerous goods in liquid and non-liquid form. Another Viscount Plastics' innovation, the liquid-tight lid for rectangular packaging, is now bringing to manufacturers of jams and other viscous liquid products the benefits of being able to use rectangular containers without the double handling of filling and sealing liner bags. Compared with round, rectangular containers can be 40% more space efficient on pallets. An extensive range of decoration options is also on offer to our rigid-walled packaging customers. In recent years plant has been installed to extend the benefits of in-mould labelling from lids to the walls of containers up to 10 litres capacity. With in-mould labelling, pre-printed labels are introduced into the moulding process to create a seamless fusion of label and rigid-walled packaging. Because the label is encapsulated in plastic it is impervious to moisture, cold and heat, and has tremendous resistance to abrasion and scratching during transport and handling. Although most ranges of Viscount Plastics rigid-walled packaging we manufacture at our Auckland factory, we do bulk buy and stock product from overseas as and when required to meet customer needs and market demands and trends. At the end of its service life all rigid-walled packaging manufactured or supplied by Viscount Plastics New Zealand is recyclable as raw material for plastics manufacture. 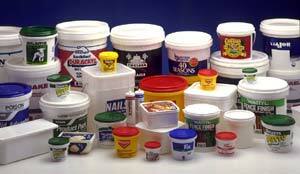 Click here to view Viscount Plastics range of packaging products.